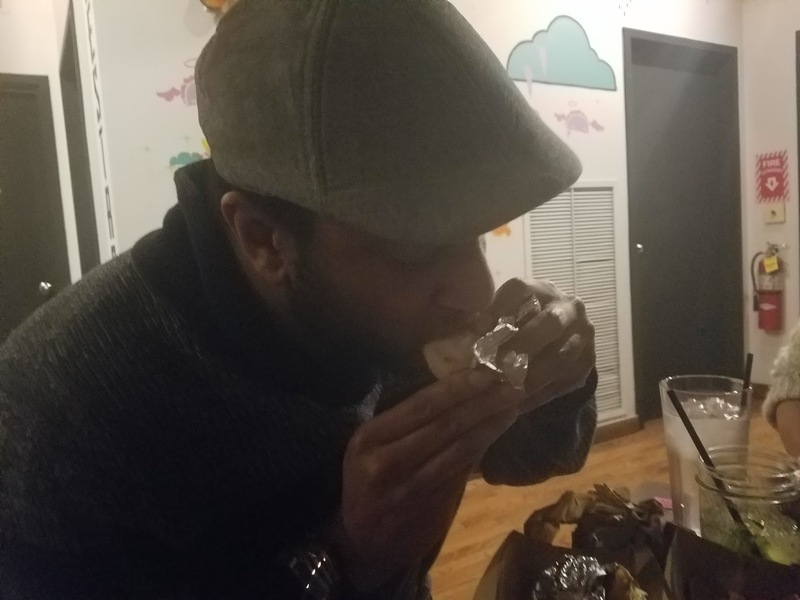 Of course you can customize your tacos almost anywhere, but how often are you given the opportunity to do so meticulously with a work sheet? Now that Bites and Brews has closed over in Shadyside, Condado is the new customization spot. 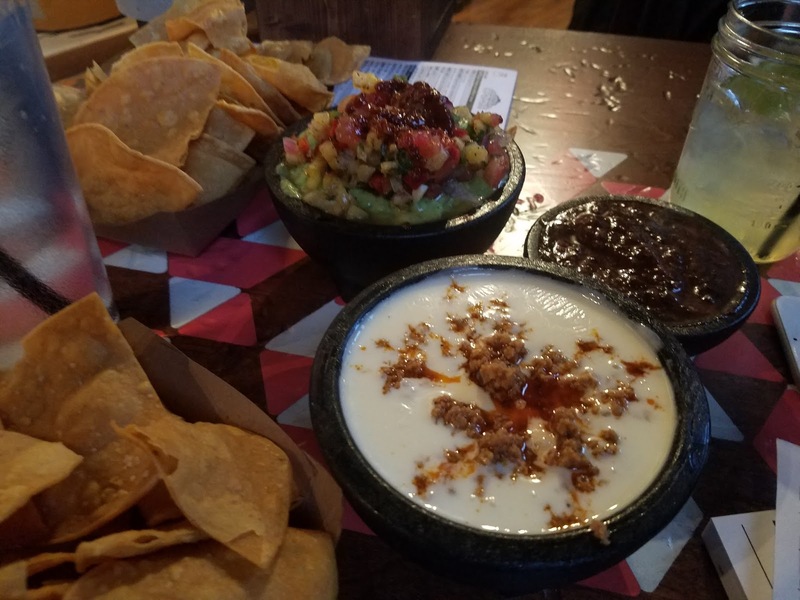 Pictured above are the queso with chorizo, the pineapple guacamole and the ghost pepper salsa. The queso was the crowd favorite. We scraped the bottom of the bowl. On our two trips to Condado we tried the jackfruit, beef, chicken and the shrimp ceviche. One of my favorite options on the menu is the "sweet Lucy." For an extra dollar you can have a double decker style taco with a hard and soft shell along with queso and gauc. Most of the other options on the customization menu come at no additional charge. For example, your choice of cheese, salsa, sauce and cabbage, tomatoes, lettuce, onions, etc. Also, be sure to add the bacon refried beans. We loved the damn things. 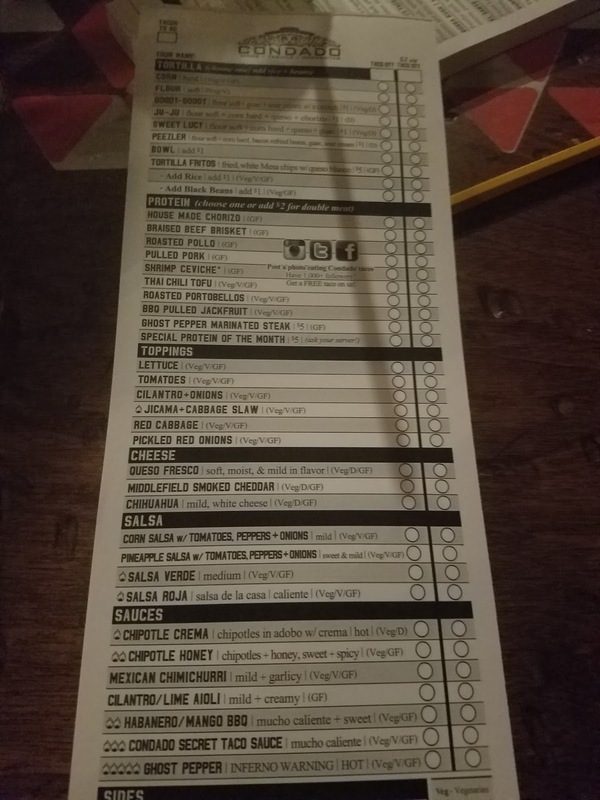 Check that menu out! The possibilities are nearly endless. Actually, I attempted to do the math. I believe the number of possibilities is 40! which equals 8.159152832 E+47. I honestly do not think I can comprehend how much that is. 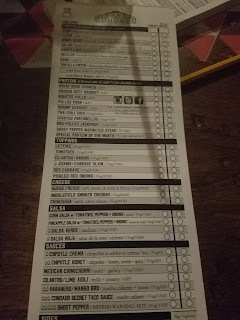 Out of the protein selections that I tried, the beef brisket and the shrimp ceviche were my favorites. The shrimp was outstanding, packed full of flavor and perfect for the sweet Lucy double decker style taco. The jackfruit was also a really unique choice. If you aren't familiar with jackfruit, don't be intimidated! It is really just a starchy filling that soaks up whatever sauce you use. I loved it, but I would always select meat over jackfruit, tofu, seitan or basically any veggie protein. Sorry vegetables.